Haven House Children’s Hospice provides the highest level of respite and palliative care to families and young people from birth to 19 years old who have life-limiting or life-threatening conditions. In the hospice children benefit from a range of play activities, as well as day and overnight stays. They also have access to music therapy, aquatic physiotherapy, physiotherapy and therapeutic yoga. In the grounds there is a specialist play area and tranquil sensory garden surrounded by many acres of beautiful woodland. Haven House Family and Community Support Manager Judi Porter says: “For the children at Haven House, colours, shapes, textures, light and other sensory stimuli make a very positive impact, and are so important for overall well-being. Our aim is to give babies, children and young people the best possible life and we knew that by bringing more colour to Haven House we could significantly improve their quality of life. A visit to Altro’s offices at Letchworth proved to be inspiration for the design scheme at Haven House, as Judi explains: “The moment we walked through the door there was an instant ‘wow’ factor. We were blown away by the incredible colour everywhere and the innovative and creative way they showcase their products. 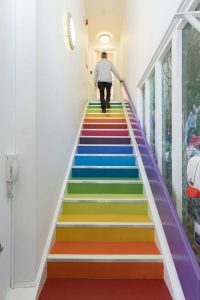 “The most impressive part of the tour was Altro’s rainbow staircase, made out of different types of flooring, which is a stunning and beautiful thing. 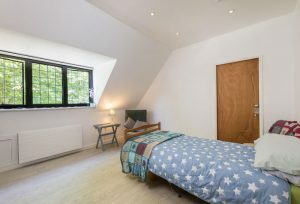 We were so uplifted and inspired by it that we knew we had to have something similar at Haven House. “Altro helped us to see that we could use colour everywhere, in both a practical and aesthetic way, create a bright and beautiful interior and still fulfil our functional brief. The Haven House rainbow staircase has been created from different colours of Altro Suprema and Altro Walkway 20 safety flooring. “Our aim was to create colour zoning in specific spaces, and Altro products played a significant role in this,” adds Judi. “Walking through the corridors at Altro’s HQ we were struck by how the floors and walls flow together beautifully, and we wanted to achieve that effect. “Of course, we couldn’t use bright colour everywhere, because some of our children are sensitive to powerful shades, so we had to strike a good balance. 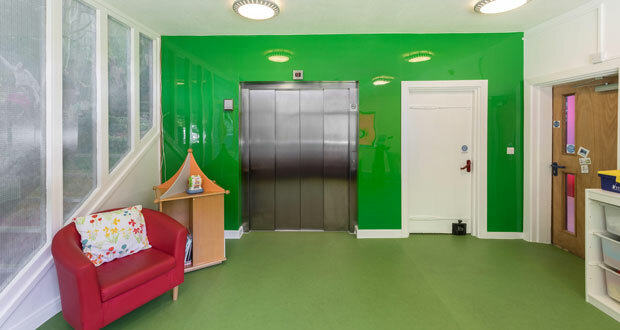 The entrance at Haven House has a green theme, provided by new Altro Orchestra smooth flooring in the shade Jungle, and Altro Whiterock Chameleon walling in Hawaiian Palm. 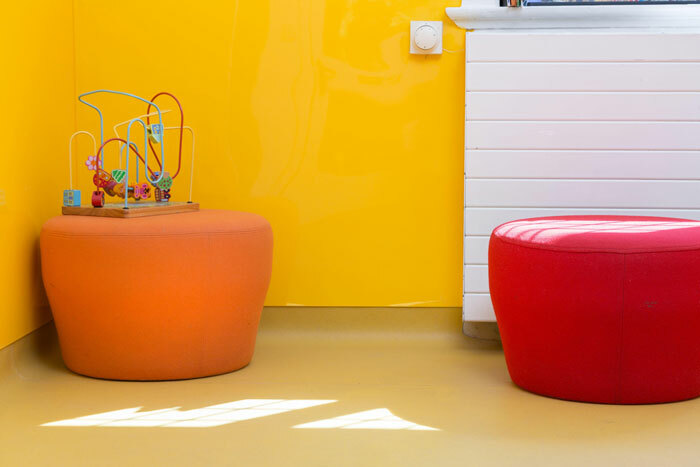 Altro Orchestra has also been fitted in the shade Trumpet in the Family Room at Haven House, which transforms into a Sensory Room via a removable partition; and in the Activity Room in the shade Jungle. This ties in with the principles of biophilia – bringing the outside in and harnessing the healing powers of nature. Continuing this theme, Altro Wood Safety flooring in Bleached Oak has been fitted throughout Haven House, in meeting rooms, cafe area, all corridors and bedrooms, creating a homely, non-clinical feel. On the entire first floor, the product has been fitted with Altro acoustic underlay to reduce sound levels. The orange-themed Changing Room at Haven House has been fitted with Altro Whiterock Satins hygienic wall sheet in the shade Bergamot, with Altro Suprema safety flooring in Tangerine. “This is such a striking room, the colours are superb and the juicy orange combination of flooring and walling is beautiful,” says Judi. The disabled toilet at Haven House has a purple theme, with Altro Whiterock Satins on the walls in the shade Viola, and Altro Walkway 20 safety flooring in the shade Silk. The blue areas have Altro Whiterock Chameleon wall sheet in Ocean Blue and Altro Walkway 20 safety flooring in Lupin. “Visual stimulation is very important for the children at Haven House, and we used Altro Whiterock Digiclad walling to create some wonderful water-themed artwork in both the Hydrotherapy Bathroom and teenagers’ en-suite” says Judi. 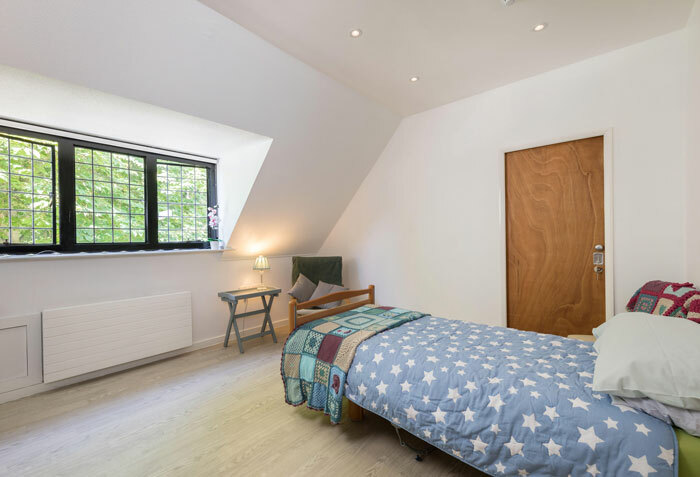 “The aim was to make these rooms look colourful and less clinical, but the artwork also needed to be permanent, hygienic and hard wearing. Altro Whiterock Digiclad is perfect because it’s so simple, yet very effective. You can create any design you want, it’s wipe-clean, hygienic and it won’t peel off. 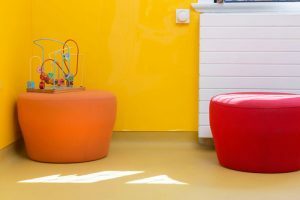 A few months after the refurbishment, the feedback from children, staff and visitors to their new colourful environment at Haven House has been overwhelming. Haven House Director of Care, Eileen White, says: “The new bright and colourful interior has had such a profound effect in so many ways, which is thrilling for us all because it’s exactly what we wanted to achieve. “We have had very positive feedback from staff, children and visitors; the mother of one teenager cried when she saw the teenage wet room with the Altro Digiclad image. Eileen continues: “So many people have exclaimed when they’ve seen the rainbow staircases for the first time. We’ve had comments such as: “They look amazing and entice you to go up and down – wow”. This was from someone who was visiting for the first time, something which a family, or individual, might not be looking forward to, but it’s so wonderful to start their experience with an invigorating rainbow of colours. Altro Orchestra 2.85mm flooring has been designed for areas where comfort and sound reduction are important. Low residual indentation enables the flexible use of equipment and furniture. At the same time, the integrated impact sound insulation system cuts impact sound by up to 15dB. It offers superb comfort underfoot, making life easier on the feet, and with a palette of 40 colours and designs varying from calming neutrals reflecting tones of nature, to vibrant shades, Altro Orchestra allows you to create the right atmosphere every time. Altro Whiterock Chameleon is ideal for making a bold statement. The glossy, vibrant and vividly colourful hygienic wall sheet is available in 16 high impact, high-design shades to add a little bit of affordable luxury to a range of environments. It has all the benefits of Altro Whiterock, offering a very durable, smooth, watertight, wipe-clean surface. Altro Wood Safety is an attractive, general purpose 2mm wood-look flooring available in a range of designs with different plank sizes and shades, including a bamboo-look fine-line design and wide plank classic and rustic designs, helping to create the right look for areas where people live and work. The flooring is designed to cope with medium to heavy traffic and has sustained slip resistance for the lifetime of the floor. Altro Whiterock Satins is ideal for creating a subtle mood using colour. This versatile and sophisticated wall sheet is available in a range of solid, decorative, satin shades – from soothing and healing through to bright and energetic. The product provides the impact resistance and hygiene you would expect from Altro Whiterock, with a stain-resistant, wipe-clean surface. Altro Suprema is a stunning, non-sparkle flooring that gives complete design freedom. With 12 new colours including three ‘flake’ designs, one of its 40 shades will match the mood you want. Altro Walkway 20 is a hugely popular, hard-wearing flooring with a range 42 colours. It gives sustained slip resistance throughout the lifetime of the product, and also includes abrasion resistance, PUR cleanability, and superior chemical and stain resistance. Altro Whiterock Digiclad is created by reproducing a photographic image or vector art onto Altro Whiterock wall sheet, with consistent, photographic quality. It makes it easy to create a bespoke design on your wall. From a calming coastal landscape in a hospital ward, to a bold company logo in a reception area, the only limit is the imagination. Hard-coat technology provides scratch-resistant properties for added surface protection, making Altro Whiterock Digiclad ideal for areas where durability is important. Altro Pisces provides superb performance whether wet or dry, in shoes or barefoot in wet environments where the likelihood of a slip is very high. With 16 soft-look shades, the result is the consistent, stylish appearance of domestic interiors, with the lifetime sustained slip resistance you expect from Altro.